The self-proclaimed prophet Elijah Ayodele has given what he called prophecy concerning Mazi Nnamdi Kanu, the leader of the Biafra Agitation, that he(Kanu) may not lead his people to the land of the Rising Sun, Biafra. According to him, DAILY POST reports, “Nnamdi Kanu’s life is at risk especially because of the way he talks, his misuse of words. “Forget about all he is doing, let him continue to pray for the dead souls. 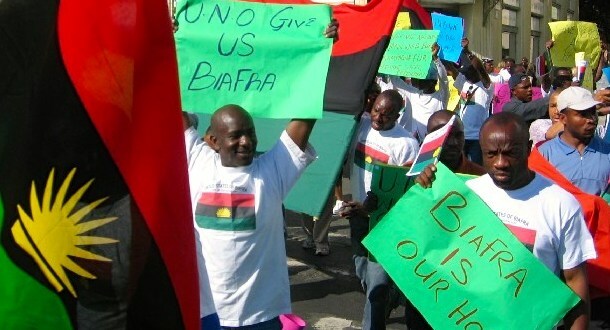 “Kanu will not lead Biafra. Biafra vision may be actualized in the nearest future, he will not lead the Igbo to actualize the vision. “He is taking some wrong steps that will fail him to actualize his dream as a leader of Biafra. “Then the Igbo should not expect the Presidency in 2019. Their time has not come. “I am talking as a prophet, not as a politician. Kanu is still going to face a lot of challenges and if he is not careful enough, he may miss it. “He must be careful so that he doesn’t lose his life in the cause of this struggle. He needs to be extremely careful and watchful” - the Primate concluded. But I do not see him as a prophet because of his choice of words. Or if he is a prophet, he was not giving prophecy but some pieces of advice to Nnamdi Kanu based on what he has observed so far. Everyone who knows the lawlessness that characterizes the Nigerian society should not wait for any prophet to tell him or her that someone like Nnamdi Kanu who is steadfast on the struggle to liberate his people will not be looked at by the Nigerian government with happy eyes. The Primate's words that “Nnamdi Kanu’s life is at risk especially because of the way he talks, his misuse of words" show that he was speaking based on what he observed. Because if he had given the prophecy when Nnamdi Kanu was still in prison, in that case, he would have said "Nnamdi Kanu's life will be at risk when he is released because he will misuse words", it would have been prophetic. Again he did not speak as a prophet when he said, ..."
Biafra vision MAY be actualized in the nearest future..."
A prophet of God is specific and certain; he does not use "may" rather he uses "will". Using "may" makes God appear uncertain about what will happen in the future and once a prophet uses the words of probability, he is not speaking from God rather he is sharing his own thoughts out of observations. The last part of his so-called prophecy which says - “He must be careful so that he doesn’t lose his life in the cause of this struggle. He needs to be extremely careful and watchful” -was just a piece of advice. And when he talked about challenges, everyone knows that the Biafran struggle has faced a lot of challenges and it will still face more challenges. So telling us about what we already know is not prophecy rather I expected the Primate to go into specifics telling us the challenges Nnamdi Kanu and IPOB will face. What I can take as a prophecy is what the Founder of Omega Fire Ministries, Apostle Johnson Suleman, said on 24th of December, 2016, concerning Vice President Prof. Osinbajo and President Muhamadu Buhari. He said, “Two times, Nigeria’s vice president, Yemi Osinbajo, will FACE REMOVAL from office. They will alienate him and they will make attempts to remove him. But God will HUMBLE Buhari in 2017..."
It is obvious that President Muhammadu Buhari has been humbled by unknown disease and Prof. Yemi Osinbajo is facing heavy threats of removal from office by the northern politicians. Prior to the time of the prophecy, nobody knew that the "almighty" Buhari would be so incapacitated and humiliated this way. In fact, now, he is viewed by Biafrans and some Nigerians as serving his jail term, which he planned for Nnamdi Kanu, abroad. Meanwhile, in 2015, I had a vision where President Muhamadu Buhari fell from an upstair. Two prominent politicians, one of which was a two-term president, jumped from the upstair as well. One was heavily drunk and then ran into the bush and the other ran mad, removing his clothes. Also, two weeks before Nnamdi Kanu was arrested I saw him in a vision where he was arrested. And subsequently I saw him in court and President Buhari, by himself, handcuffed him (Kanu) and he (Kanu) was furiously speaking in court but his lawyers were begging him to take it easy. I also saw Kanu released and he was walking majestically but could not answer questions posed to him, but did nod in the affirmative when he was asked whether he was going back to court. I later understood that his bail condition that stops him from speaking to the press was the reason he could not talk in the vision but nodded. I have also had a dream where he won in court and Biafrans were lifting each other up in celebration. Those could be examples of prophecies because they were received before the events took place, although in my own case I did not air them. So, next time when Elijah Ayodele wants to speak as a prophet, let him not use "may" rather let him be specific and speak with certainty, and not in uncertainty. Let him speak before things become obvious and not speaking from his observations of events when things appear predictable, if not I will take him as a "Bet9ja" player. This Yoruba prophet may have been paid by the zoo government to wish Nnamdi Kanu Dead. Just as TB Joshua a Yoruba prophecy indicated that Donald Trump will lose the last presidential election and the result came out the reverse. The evil death wish that this Yoruba Prophet is wishing for our leader Nnamdi Kanu shall not get to the destination instead the arrow will return to sender. And so shall it be!! !